There is a widespread belief that the implementation of the goods and services tax (GST) will herald a new era for logistics firms. The new regulation will strengthen organized companies’ competitive position vis-à-vis the unorganized sector, as customers will be allowed to offset service tax under GST. Currently, a large part of the surface logistics business is handled by the unorganized sector as tax avoidance helps them keep prices lower. The second benefit is the transformation of India into one market. Post GST, stakeholders expect customers to consolidate their warehousing requirement to the hub and spoke model and drive business to efficient transportation solutions providers. “As inefficiencies and costs come down, inland transport would be more cost effective. This increases business, creating the space for expansion,” says Prakash Tulsiani, executive director and chief operating officer, Allcargo Logistics Ltd. But the Street is not yet fully convinced. As GST implementation is now round the corner, shares of TCI Express Ltd and Gati Ltd have gained 19-38% in the past two months. VRL Logistics Ltd, which is also focused on local logistics, is up less than 2%, while Allcargo Logistics Ltd lost 5%. VRL and Allcargo are also lagging behind on one-year returns, compared with the BSE 500 index. Some stocks recovered a bit in recent weeks. But the euphoria is missing. Why? Among the several reasons, one is the subdued business environment. The second is the lack of clarity on GST benefits. Antique Stock Broking Ltd notes that the business model which will lead growth post the roll-out of GST is still unclear even as “managements share different insights on growth opportunities”. Analysts warn competitive intensity can rise as the sector consolidates post GST. Besides, they expect the unorganized logistics sector to move into the tax net rather than risk losing business. In other words, there may not be a large amount of business for grabs, as many of these firms may remain in business. Tulsiani of Allcargo Logistics says demand may see a gradual rise as customers will take time to adapt to the new system. “We sense that companies will take some time to adopt and understand the implications of GST and then take a cautious call. The demand increase should be able to take care of available supply,” Tulsiani adds. Sandeep Mathew, an analyst at SBICAP Securities Ltd, reasons that the requirement for scale and cost-efficient solutions may benefit large organized firms more than smaller firms. “Smaller players will have to start focusing on niches (eg. underserved markets) to effectively compete with larger players,” Mathew adds. Of course, the overarching belief among the experts cited above is that GST will have a positive impact on the sector. Tulsiani of Allcargo Logistics validates his view by pointing to outsourcing of warehousing activity by private companies. Mathew of SBICAP Securities expects companies to start reflecting the positive impact of GST in earnings from 2018-19 onwards in a more meaningful manner. 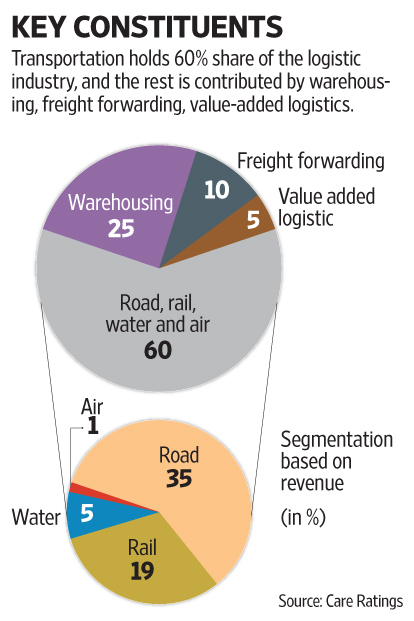 While these expectations should keep hopes alive for logistics firms, the way things are currently also suggests that business will not come on a platter for them. Depending on the region and client profile, they will have to realign their service offerings in a cost-efficient manner. The next six months will provide much required cues about the kind of growth opportunities that GST throws up, and how companies are pursuing them.